It’s a question I get asked all the time – “How do I get a (fill in the blank) stain out of my granite countertop?” Well, there’s a pretty simple formula that takes 5 minutes worth of work, a few basic ingredients, and a little bit of patience that will tackle most of the spills that cause granite countertop owners headaches. First off, understand that it’s a spill, not a stain. A stain implies that the stone has absorbed whatever you’ve spilled – that’s not exactly right. The granite used for kitchen counters is not a single stone – it’s a combination of different crystals and minerals that are bonded together. What actually happens is that liquid gets trapped in the space between these materials, causing the appearance of a stain. In essence, we aren’t trying to get ‘blood from a stone,’ so to speak – we need to remove the liquid that’s trapped in those natural crevices. To do this, you’ll need 4 basic things: an absorbent medium, a chemical agent, plastic wrap, and masking tape. What is an absorbent medium? It’s basically anything that will soak up liquid – in our case, since we’re adding another chemical to it, we want something that has a pretty neutral pH as well. 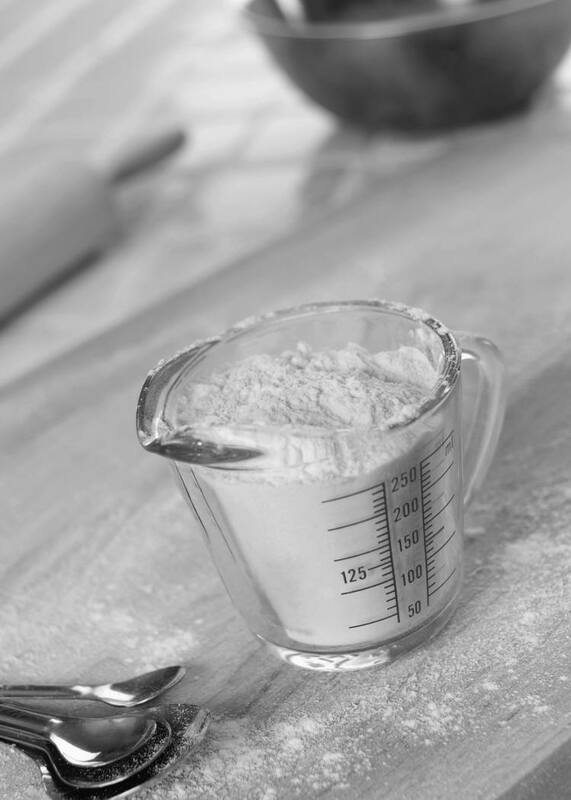 Some ideal things are: baby powder, unbleached flour, corn starch, or even paper towels will work in a pinch. Since baking soda doesn’t have a neutral pH, I’d skip it as an option for this application. For most food-related stains (wine, sauces, coffee, etc. ), use a high-concentrate hydrogen peroxide solution. Usually the type you get at the drugstore is a little weak, so it may be worth a trip to the beauty supply store to get a bottle of stronger stuff. For oily stains, we need acetone. Make a trip to the hardware store and pick up a can of acetone with the painting supplies. 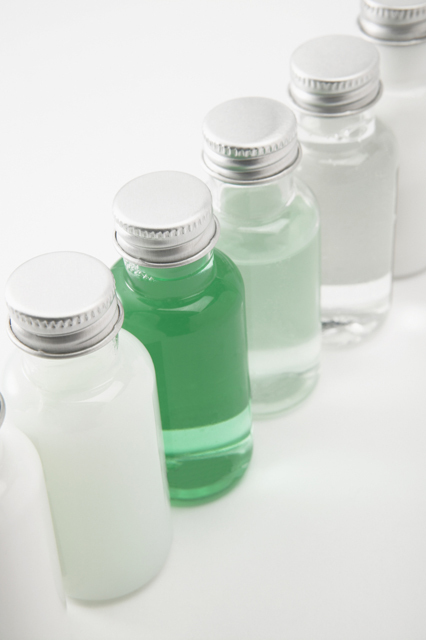 Even though nail polish remover has acetone in it, it also has other chemicals as well. For living stains (mold, mildew), household bleach. For metal stains (rust, etc. ), grab some Iron-Out from the hardware store. For other types of stains (inks, dies) there’s denatured alcohol on the same paint aisle as the acetone. The first thing we do is make a paste out of the absorbent medium and the proper chemical needed for the spill. We want enough to cover the stain and about ½” wider. In a glass or non-reactive bowl, mix in enough of the chemical with the absorbent stuff to create a paste with a yogurt or peanut butter consistency. We want to be able to spread it, but not have it run all over the place. (If you’re using Iron-Out, dissolve it in water first according to the package directions). If you’re using paper towels – use several layers, saturate them, and wring out the excess. Next, we want to apply our paste to the stain. Spread it evenly so that it makes contact with the entire stain (it may be a good idea to use rubber gloves for this). Then cover the paste &amp; spill with plastic wrap and seal it up on all sides with the masking tape. What we are trying to do is force the chemical into the stone crevices without the paste drying out. Leave it alone for about 24 hours. After 24 hours, remove the plastic wrap, but leave the paste. Now that the chemical has penetrated the stone, we want the paste to dry out and pull the liquid back out of the stone. Let it dry completely, and don’t mess with it until it’s dry. Use a plastic utensil to scrape off the dried paste. Use a little stone cleaner and a paper towel to buff it up, and you should be done. No more spill. Now, if it’s a deep penetrating spill, you may need to repeat the process. Unfortunately oily spills tend to be stubborn and may need 3 or 4 applications. Once you’ve removed the stain, you may want to consider resealing the countertop. 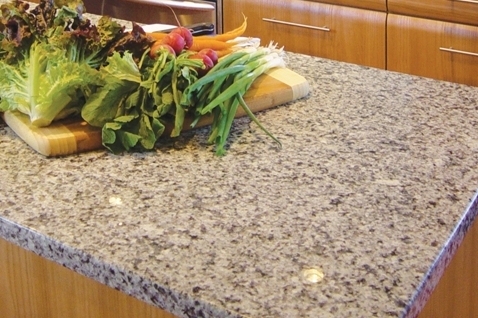 Basic countertop sealers last 12-24 months. If it’s been longer than that, it’s probably time for another application. It’s also important to note that some stains can become permanently set if they sit for too long with out attention. So ‘sooner rather than later’ is a good motto for granite spills. 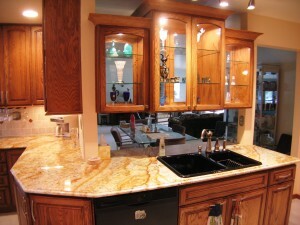 This entry was posted in Design and tagged cleaning, countertop, granite. Bookmark the permalink.